RICE LAKE, WI (August 3) – Matt Leer’s last lap pass for the Modified feature win was one of three last lap feature winning moves on an exciting evening of racing Saturday night at Rice Lake Speedway. Leer also became one of four first time winners at the speedway on Saturday, with only Adam Soltis becoming a repeat winner. Soltis was one of the other last lap winners along with Shane Halopka who himself became a first time winner at the track this season along with Eric Olson in the Super Stocks and Darwin Brown. It looked like Jason Gross was going to be the Modified winner on Saturday, as he led nineteen laps before being overtaken on the final tour of the oval. Gross started on the pole and got the jump on Buddy Mayala and then began to build up a substantial lead in what turned out to be a nonstop main event. Leer had to fight his way past a strong running Scott Miller to move into second and by the time he got to the position, Gross had at least half a straightway advantage on him. As the race remained under the green, Leer slowly but surely began to close the margin but it wasn’t until the last five laps that he began to cut the lead considerably as Jason began to lose traction in the corners with Leer gaining much ground on him. With two laps to go, Leer closed to the rear bumper of Gross and got a strong run off turn four. Matt dove to the inside as they came down the front chute and with Gross trying to protect his position, the two leaders got together. Both got sideways but both straightened out and raced on. Gross continued to hold a small lead as they raced down the back chute with Leer again trying to get inside Gross. Flying through the final corners, Gross slid out just a little and Leer dove inside him. They raced to the line with Leer winning by a car length. While the two leaders battled, this gave Kevin Adams the chance to catch them, and he flashed across the line just another car length behind Gross. Mike Anderson and Paul Brust completed the top five. The second race to provide a breathtaking finish was the Midwest Modifieds where Halopka overcame Tito Viltz on the last corner for the feature win. Don Drew out battled Mike Schnider early as the out of retirement Hall of Famer led his first feature laps of the season. However, Tito came charging up from the third row to challenge and after a wheel to wheel battle, Viltz was able to edge into the lead. Three yellows marked the first three laps of the race, but after that the Midwest Mods ran nonstop and as Tito started to pull away, Halopka was able to come from the seventh starting position to move into second past Drew, dragging Ryan Viltz with him. Tito continued to lead but Halopka was pushing very hard in the corners as he started to close the gap. With two laps to go, Tito had his car push out in turn two and Halopka used that time to really cut the lead. They flashed under the white flag nose to tail with Halopka looking for an opening. Racing into turn three, Tito’s car again pushed up the track and Halopka made a cross over move and ducked under Viltz. They raced to the line and Halopka took the win by a car length in a startling turn of events. Ryan Viltz finished a close third with Travis Anderson and Drew behind them. The other nail biter was in the Street Stock finale where Soltis edged out Josh Amans by inches for his second win at Rice Lake this year. The race had a scrambled start with three quick yellow flags in the first two laps and some jockeying of position. Rookie Troy Chaplin led his first feature laps when things settled down but following the last restart, Amans, who came all the way from eleventh on the grid and Soltis, from eighth, split the lead with Amans moving into the lead and Soltis trailing him. The top two drivers got away from the pack and started their own private battle for the lead. Amans was leading with Soltis right on his tail, but when Josh slid up the track, Soltis was right there to race under him. However, Amans wasn’t done yet, as he made the higher side of the track work, and as the laps ran down the two put on a great show, running lap after lap, side by side and not even touching. It was some of the best Street Stock racing seen all year, and as the white flag waved, they were still side by side. They continued like that down the back chute and in the final corner Amans broke traction for just a second, giving Soltis the break he needed. As they flashed under the checkered, Soltis edged ahead by half a car length for the win. The leaders had slowed each other down with their late battle , and Sam Fankhauser nearly caught both on the final lap, as he finished only a half car length behind Amans in third. James Vought had a strong run from the back of the pack for fourth with Chaplin earning his first top five finish. Olson has won at the track this year in the Street Stocks but Saturday marked his first win of the year in the Super Stocks. He got to the front quickly and after a short battle with Scott Zitelman, moved into the lead. Shane Kisling and Aaron Wilson were chasing him, with Wilson moving to the high side and following a lap twelve yellow for a spin, taking over second. For a few laps Wilson seemed to be gaining on the leader, but then Olson settled down and picked up the pace and maintained his margin. Wilson couldn’t get any closer as Olson drove home with room to spare for the win. Kisling maintained third but two drivers who started deep in the field picked up the pace at the end and raced into fourth and fifth. Jeff Brauer found the high side and he worked all the way up fourth at the end with Bart Steffen following him and both were closing on the leaders but ran out of laps at the end. In typical Darwin Brown fashion, the veteran driver waits until August to show up at the track and then wins right off the bat. It was his first night out Saturday, but he wasted no time in earning his first win of the year in the Pure Stocks. Mike Grover gave a good account of himself Saturday, taking the early lead and fighting off several challenges for the top spot. However, Brown moved up from the third row and using the higher side of the track, was able to edge past Grover and take over the top spot. Following a lap four yellow when point leader C.J. Wagner had a wheel sheared off in a collision, Brown continued to lead with John Erickson making a determined drive up to the front after starting ninth on the grid. He raced into second and got close to the leader but the smooth driving Brown, wheeling his trademark Ford Thunderbird, didn’t give Erickson any openings and drove home for the win. Nick Traynor had a solid run for third with Jay Folz and Bob Thompson completing the top five. 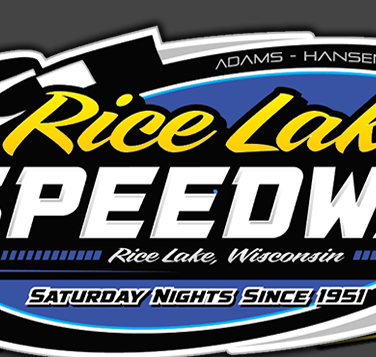 Next Saturday night is Hall of Fame night at the speedway with eight new members being inducted into the Rice Lake Speedway Hall of Fame. Next Saturday’s show is one of only two point nights left at the track, with some very close point battles going on. 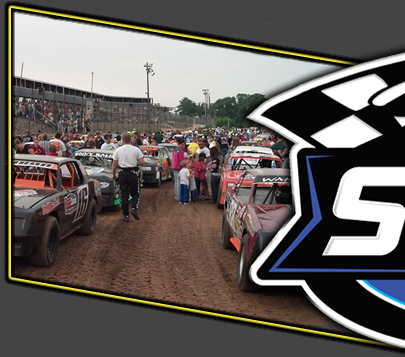 On Thursday, August 15, The USMTS Modifieds make an appearance with their national driving stars taking on the local competitors in a $3,000 to win event. Midwest Modifieds and Pure Stocks will also race. 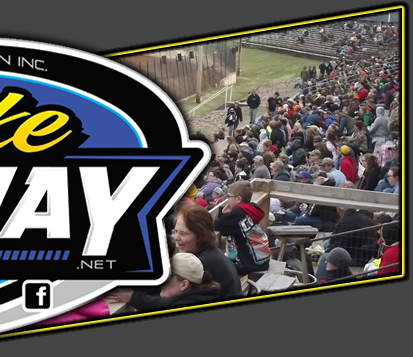 The bikes races, rained out last Saturday, will be a part of the program on August 24, which is also Championship night at the speedway before the season closes out with racing over the Labor Day weekend, with a doubleheader scheduled to wrap up the short 2013 season.